Pre-Requisites: No prior email experience is required, however we do recommend you have taken our Internet 101 class first. Windows 101 and 110 are beneficial as well. We use Microsoft Outlook XP (2002) in class. You will be fine if you have Outlook 2000 or 2003. The interface is significantly different in Outlook 2007 though. Note that this class does not cover Outlook Express. Throughout our Microsoft Outlook series, you will learn all of the ins and outs of Microsoft Outlook, including sending & receiving email, using the calendar, creating and managing contacts, using tasks, notes, and so on. We'll also teach you about the advanced features of Outlook including message rules and forms. We'll even share our tricks for remaining SPAM free using special Outlook features. 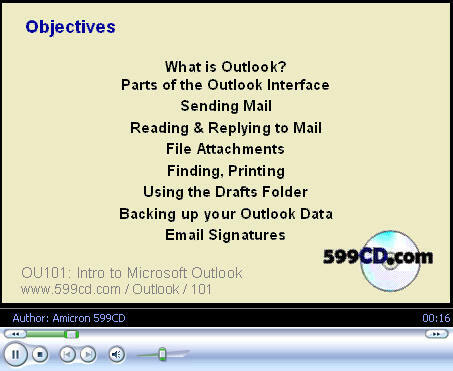 The first course, Outlook 101, covers the features of Outlook, sending email, replying, using attachments, and more. Please note that this course covers Microsoft Outlook, and NOT Outlook Express. Outlook Express will be covered in our Internet 102 course that will be released soon. Our course uses Outlook XP, but most lessons are valid for all versions of Outlook. Shpat on 1/23/2008: Great Job! Richard Rost on 1/24/2008: Thank you. to be send out. But I do not see a prompt for SEND. Richard Rost on 4/29/2008: Loreta, make sure you have your standard toolbar on (View > Toolbars). What version of Outlook are you using? I am trying to send. Richard Rost on 5/24/2008: Loretta, check the format of the email itself. If the name is bad, perhaps something like "joe@hotmail." and nothing else, that could cause it to sit there. ALSO, you might have to open up the email again and click on the SEND button inside the email window. Outlook sometimes gets stuck on an email if it's sitting in your outbox, and then you OPEN it, and then CLOSE it again without clicking SEND. It treats it as a DRAFT copy somehow. Verna Halalet on 7/15/2008: I have a question. When I get a message with picture attachments is there a way to open all the pictures at once or do I have to open each individually like I am. Also does the 599cd cover this type of problem? If yes I would order the cd then. Richard Rost on 7/22/2008: Verna, with Microsoft Outlook, the best you can do is click on SAVE ATTACHMENTS... and then save all of the pictures to a folder on your drive. Once there, you can open them all up by selecting all of them (CTRL-A), right-clicking, and then selecting OPEN. Juanita Watson on 1/7/2010: I wanted to find information on Contacts. Is there another course on this? Richard Rost on 1/15/2010: Juanita, we don't cover contacts in Outlook 101. Those will be covered in a future Outlook class. I'll have an Outlook 2007 class coming out soon.